Posted on Sat, Mar 10, 2012 : 7 a.m.
Editor’s note: This is the second installment of a planned weekly column by Paul Wiener designed to point readers to cool or useful websites. Showing us exactly where places are and how to get there is one of the great boundless gifts of the Web. Who hasn't used internet mapping technology at least once in the past week? But not only every place can be mapped; every thing can be mapped as well. Google Maps has long made its basic code available for free to anyone who can use it, and thousands have done so to map things no one ever thought possible. Wanna know where Australia’s coal seam gas wells are? The location of the references (gap.alexandriaarchive.org/gapvis/index.html#book/17) in Gibbon’s Decline and Fall? Where Florida’s invasive species are crowding? Where you can rent a bicycle in Dublin? How freedom of the press is rated for every country in the world? No? Then search for thousands of probably more interesting, useful and unlikely maps on the Google Map Mania blog (which is not maintained by Google). Chances are you've already used some of the mapping tools buried in this site. Hundreds of businesses, organizations, schools, agencies and scholars around the world have embedded them in their pages. And if you’re so inclined, you can always create one that doesn’t exist. If you’re sure it doesn’t. 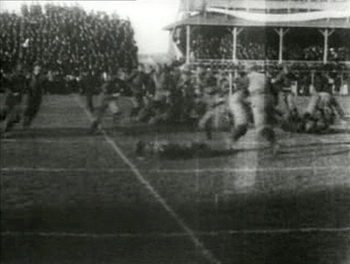 A frame from a film shot by Thomas Edison of a 1903 football game between the University of Michigan and the University of Chicago. The film is among thousands of treasures that can be found at the Library of Congress American Memory site. What digital photographer doesn't like to play with — I mean enhance — her photographs? And who hasn’t seen or sent dozens of hilariously "Photoshopped" photos, created or found, to friends? Yes, there is decent free image editing software out there. But don't we all secretly want our own Adobe Photoshop? What makes Photoshop so great? Is it its features, its quality, its name? Maybe. Or maybe it's the brand name and the price: anywhere from $150 to well into the $1,000s. Yes, owning software can be as status enhancing as owning an expensive car or camera. Owning free, open source software, on the other hand, rarely earns bragging rights. That’s where Gimp (what a name!) comes in. This free, easily downloaded package has virtually every feature Adobe has, is just as challenging to use, is just as stable, and can produce work up to most professional standards of excellence. Some of its features can be seen at www.gimp.org/features. And even if using it isn't quite intuitive, you can practice using its hundreds of options until that special someone buys you the more expensive — and equally complicated — toy. It can be hard to love the vast, labyrinthine Internet Archive, with its boxy, text-dependent, colorless, plainspoken interface challenging you to explore its infinite depths on your own. But what else would you expect of an electronic cemetery? Its dead are only buried by a GUI — but beneath the surface they are honored like all veterans of life. With its million-footed collections of newsreels, full text books, game software, TV shows, sound recordings, old advertisements, promotional films, ancient sound recordings, silent and/or feature films and other unclassifiable ephemera, the Archive would seem to contain all the recorded detritus ever produced in the last 100 and 60 years (yes, there was photography in 1850). But of course it doesn't. It's only the remains of the day. No matter. It is a feast for the serendipity-bound treasure hunter anyway and will keep you occupied until your time comes to join it. By the way, have you ever seen the Wayback Machine — the archive of 150 billion web pages? It’s there too. Want to know what suburbia was like in 1957? Like the Grand Canyon or fractal images, the more you delve into this archive the more unexpectedly infinite detail you find. The Library of Congress may be the largest library in the world, with its 32 million books, 61 million manuscripts and 838 miles of bookshelves. But its 10 petabytes of digitized objects go largely unsung. Its American Memory site gathers these petabytes and stores them in the form of thousands of exhibits and collections, many of them created by libraries all over the country. Here are music, newspapers, letters, old photographs, early movies, ancient sound recordings, advertisements, texts and everything inbetween. While the Internet Archive collects similar materials, American Memory makes them available as discrete, curated, often rich and colorful online exhibitions. On display is everything left out of history textbooks — the forgotten, the folk, the sometimes tribal, racial, hidden, glorious idiosyncratic histories rescued from stockpiles of memorabilia, attics, garbage and pride. Libraries and search engines are just beginning to link to many of these items invaluable to historians, scholars and hobbyists. Who would expect to find there an early film of a 1903 University of Chicago vs. U-M football game? Paul Wiener of Ann Arbor worked for 32 years at Stony Brook University, in Long Island, N.Y., where he managed the English Literature, Art and Film Collections. He may be reached at pwiener@gmail.com. Mon, Mar 12, 2012 : 9:57 p.m. I have to remember that this column appears on Saturdays--I always forget until it's Monday and I realize I'd missed it. And I don't want to miss it because it's so good! How did you find that film frame of the UM/University of Chicago game? Is it that easy to navigate the Library of Congress Web site and pull things off it? Well, I can't wait to try! Keep up the good work--both in finding these interesting sites and writing so interestingly about them! Mon, Mar 12, 2012 : 11:11 p.m. Thank you! The Library of Congress' American Memory site isn't the easiest to use. You really have to look for things, and sometimes their topic headings aren't what yours might be. But don't get discouraged: searching is half the fun. The example I used was meant to show people what riches exist in the site. Good hunting! Sat, Mar 10, 2012 : 3:55 p.m. I don't know who is luckier: your wife for having a husband more interesting than the web, or you for having such a discerning wife. Sat, Mar 10, 2012 : 3:33 p.m. Imagine what today's film will look like in 110 years...many thanks for this info. Sat, Mar 10, 2012 : 1:25 p.m.